Upon meeting Eric Newman, what strikes you immediately is his affable and humble demeanor. 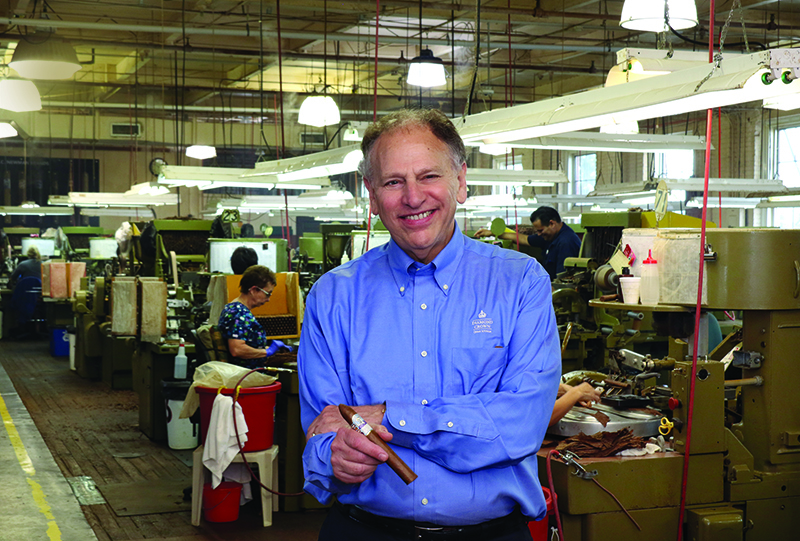 As the president of J.C. Newman Cigar Company, the oldest premium cigar company in the United States that is still owned by the founding family, according to a 2012 Cigar Journal story, Newman could take himself pretty seriously. But he doesn’t. That passion for premium cigars and people is evident as Newman walks around the family’s landmark factory in Ybor City, a classic red-brick building called El Reloj (Spanish for “the clock”) for its large clock tower. His face lights up as he chats with employees, some using machines made in the 1930s to roll cigars, while other craftsmen roll by hand at impressive speeds. As he jokes with employees and asks about their families, it’s clear his heart and soul is in this business. That’s been the family way since 1895, when Newman’s grandfather, Julius Newman, borrowed $50 for tobacco and received his first order for 500 cigars from the family grocer. At that time, the immigrant family from Hungary was based in Cleveland. The company relocated to Tampa in 1954 to be a part of its world-famous cigar manufacturing community and to be closer to Cuba, its primary source of tobacco. Today, the company owns Cuesta-Rey, Diamond Crown in the Dominican Republic, and El Baton in Nicaragua, among many others, and runs the U.S. sales force for Arturo Fuente cigars. In 2016, the company introduced Fourth Generation Cigar Co., a boutique division of hand-rolled cigars made in the Tampa factory and run by Newman’s son, Drew. Newman is proud of his family’s longevity in a business that has had its ups and downs, including the Great Depression, two world wars, the Cuba embargo, smoking bans and rapid industry consolidation. This deep sense of community and doing what’s right to help others is ingrained in Newman and his family. In 2001, the family founded the Cigar Family Charitable Foundation with the Fuente family of Arturo Fuente Cigar Co. The foundation has built two schools, a medical clinic, sports facilities, and an organic farming area in the Dominican Republic, where most of the company’s premium cigars are made. There is something undeniably young at heart about Newman. That’s proven by a great passion that, at nearly 70 years old, he recently decided was time to give up: football referee. For 46 years, he officiated football games, from youth leagues to high school varsity. A former high school player at Tampa’s Berkeley Preparatory School, Newman began officiating in 1972, making $30 a game. When he retired, he was making around $60 a game. He estimates he has officiated at least 800 games, including middle school, junior varsity and varsity. Newman does have football to thank for bringing him together with his wife of nearly 40 years. In 1976, he attended a party after a Tampa Bay Buccaneers game where he met Lyris. Two years later, she became his wife. With his referee days behind him, he looks forward to traveling with Lyris to Normandy in October, and to spending time at their family beach house on Belleair Beach. He’s also looking forward to playing more golf. “I try to break 100 on the golf course. If I break 100, it’s a good day, and I don’t have that many good days,” he says with a laugh.